The Texas Essential Knowledge and Skills will have second grade students learn cursive letters. The state mandated that all districts must include cursive in the curriculum for the upcoming school year. "I know we have the internet and things of the sort, but I think it's a good habit to teach them old skills," said Nehemiah Oatis, a Killeen parent. When state educational standards opted against requiring cursive, many districts dropped penmanship. 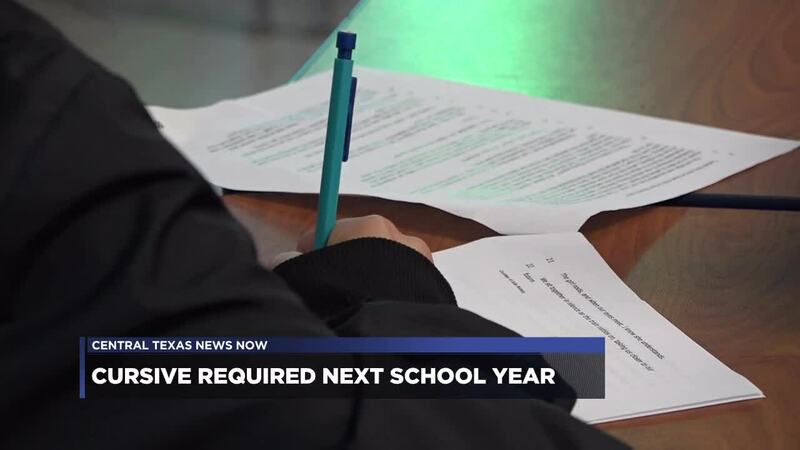 Temple ISD includes cursive in their lesson plans, but will begin teaching it to their students a year earlier than before. Belton ISD, however, does not currently include it in their lesson plans. "It’s important that our kids are able to communicate through the written word and through the spoken word," said Elizabeth Giniewicz, executor director of elementary curriculum for Temple ISD. Some argue that in the digital era, cursive is not necessary. But supporters say there are a number of benefits, including hand-eye coordination and developing fine motor skills. "It helps make those connections and the fluid strokes and all of the lettering so your brain just develops appropriately," said Giniewicz.